How old is this fax machine, is it easy to set-up, what's the cost of cartridges and what kind of problems can I expect? We only supply the HP Fax 925xi ink cartridges so we can only offer you help with ordering cartridges for this printer. Please contact HP for the date of manufacture and specications of this machine. The HP Fax 925xi printer use a HP 20 black ink cartridge which is available from us in a genuine HP cartridge or a compatible branded cartridge made by a third-party manufacturer as a cheaper alternative. The price of these two items is displayed on this page on the right-hand side of the screen above the "Add to basket" icons. The HP Fax 925xi printer is an efficient entry-level fax machine that uses plain paper. The Fax-925xi is specifically designed for frequent use, so HP gave it a robust inkjet print engine, a resilient G3-compatible fax modem, and higher memory capacity to meet the needs of the growing small office. The HP 925xi Fax is feature-packed, but it is prone to paper jams. Customer and technical support is also difficult to get which can be frustrating for owners of the HP 925xi monochrome inkjet fax. This 6.8Kg fax machine and copier in one features a monochrome inkjet engine enclosed by a simple frame that measures 8.1 inches tall, 11.3 inches deep, and 17 inches wide. There is a 20-sheet automatic document feeder and a 150-sheet standard input tray on top, while the 50-sheet output tray is at the bottom front of the HP Fax 925xi. All controls are isolated on the top right-hand side of this device. When ink or paper runs out, the fax retrieval feature of the HP 925xi fax machine ensures that you don't miss out on any messages. Plain paper faxing ensures high quality output that won't fade or curl over time. There are 100 coded speed dials along with one-touch speed dials on-board the HP Fax 925xi inkjet printer for more convenience. Scan-and-send and fax forwarding features are also among the features of the HP Fax 925xi fax printer. Ink costs are minimal thanks to the high capacity black HP 20 fax cartridge that goes in the HP 925xi printer. The Fax 925xi monochrome fax is quite outdated for the busy office because of the 14.4Kbps modem and the memory capacity, which is only good for 65 pages. PC fax is unavailable. 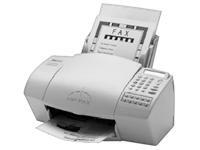 The HP Fax 925xi black and white fax / copier can be prone to paper jams. Some users complain that they have a difficult time finding product support for the 925xi Fax when the warranty expires.